Imagine relaxing on a white sandy beach, the soft ocean waves rolling in the distance and the tall palm trees moving to the beat of the onshore breeze. You’ve got your own lounge, complete with straw-thatched umbrella and if the time is right, a bar close-by to find that perfect beach cocktail. This and so much more can be uncovered at The Anam, a five-star luxury beach resort located on the northern Cam Ranh Peninsula in Vietnam. It’s quite possible that you’ve never heard of this part of Vietnam. If luxury beach resorts are your style, it’s possible you would be more likely to recognise names such as Nha Trang and Danang. These are the beaches in Vietnam that attract more attention, but of course, in return, they are more heavily visited. Nha Trang, in particular, is frequented by large tour groups of Russian and Chinese tourists, which can mean the area is open to more than a little frenetic activity, especially if a more quiet scene is what you are looking for. That’s why The Anam is perfect. Located in a much quieter part of Vietnam, The Anam is in an area still in the early stages of development, about 30 minutes drive south of Nha Trang. If you are looking for some peace and quiet, luxury, great food, and access to some excellent wellbeing services, The Anam is definitely worth considering. If there’s one thing I love, it’s meeting interesting business people, so I was thrilled to be able to dine with Mr Pham Van Hien one evening. I’m sure this won’t be the first time someone has mentioned it, but I was struck by the youth of this multi-million dollar resort. Born in North Vietnam, Mr Hien was a child prodigy at school. His Father worked for the government in the north but his siblings worked in the south. His brother and his cousin became soldiers in the south, creating an interesting family situation. Following school, he won a government scholarship to study abroad. Despite the unification of the country, his options were limited to eastern bloc, communist countries. Here he earned his PhD in Physics at a Czech university. Later, after the collapse of the eastern bloc, Mr Hien saw lots of opportunities and a chance to use his skills in the business world. He exported Asian goods to Europe and reciprocated by bringing European goods back home. This set up his future businesses, often with several running at one time. Travel was one of them and it set in place a sequence of events and experiences that would one day lead him to develop this resort. First impressions count. Whether it’s that person you are meeting for the first time, a potential house you are considering purchasing, or a new city you are visiting, what you see and hear first are usually the most important. They frame your next thoughts and ultimately can make or break a decision. It’s no different with resorts. In fact, if you have paid top dollar to stay in a resort promoting its five-star services, then those first impressions become critical to how much you will enjoy your time there. Having stayed in two luxury resorts in Danang, further up the coast on a previous trip, I also had high expectations. The Anam is a sprawling resort with a lush green oasis of palm trees and grass built on a sandy foundation. It’s a low-rise resort which contributes to the tranquil surroundings. Villas are tucked away in amongst the greenery as opposed to towering highrise apartments that is out of place in a natural setting such as this. The lobby area ticks the first box as we arrive at The Anam. Here in Vietnam, the climate is hot and humid, but on the oceanfront, there’s often a cooling sea breeze. The design of this resort is such that the lobby area is open plan. With the check-in, concierge and in-house tour desk all in operation under the high timber ceilings, it’s the perfect entrance. Guests can take a seat and have a welcome drink as they wait for the necessary check-in procedures to be carried out. Tinkling fountains, pools and more greenery surround you, making you feel instantly at ease. The check-in process is straight-forward and a member of staff will come to the lobby to pick up your bags (and you if you wish) and take them to your villa. 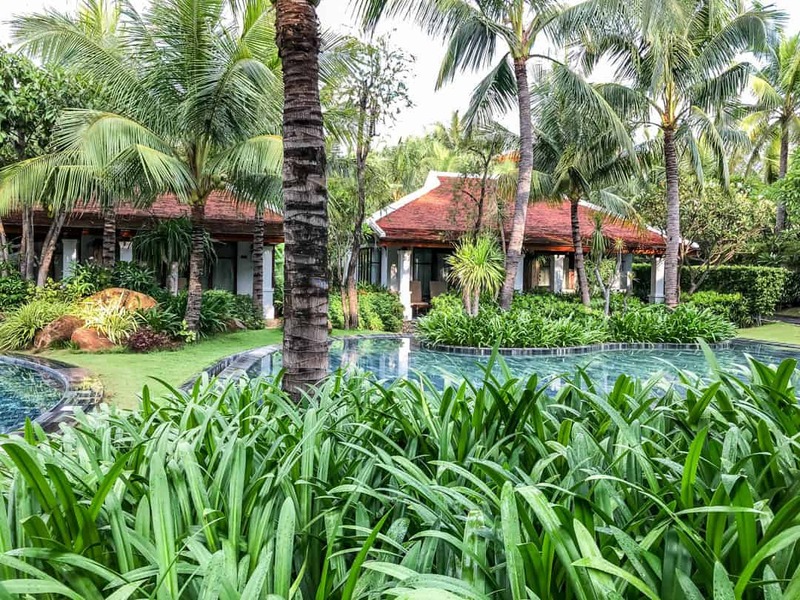 Set amongst the plantation of palm trees and other green foliage, 117 villas and 96 resort rooms of varying sizes and inclusions cast a nod to the influence of the French colonial rule. Not surprisingly, all villas are designed with a view in mind, be it the garden, pool or ocean. Your decision will centre around that along with your space requirements, whether you want a private plunge pool and of course, your budget. Where possible, the resort has been designed using sustainable products sourced locally. The rooftops are made from materials coming from owner Mr Hien’s home province near Hanoi. All stone is sourced from North Vietnam. The lighting in Lang Viet restaurant is handmade. At 50 square metres, my pool view villa is spacious. Built as a duplex, it has a private entrance leading from the main path and a security screen on the rear patio for privacy from my neighbours. The room feels immediately cool with the beautifully patterned tiles all of which are sourced from Ho Chi Minh City. Along with polished timber floorboards, they are the perfect floor covering in such a hot climate, and functionally sensible given the constant access into the garden and pool area. Designed to take advantage of the surroundings, the king size bed is central to the room, allowing easy movement all around the villa. Facing outwards, the bed takes in the view of the garden and pool where your privacy is protected, if you wish, with sheer curtains. In the evening, heavy block out curtains are also available. As someone who loves having everything open, I would have dearly loved to have my doors open in the evening to let the breeze in. Alas, I’d more than likely be inviting in some unwanted critters, and to my disappointment, there are no security screens meaning anyone could have access to my room whilst I slept. This meant I had to rely on the (very good) air-conditioning or the overhead fan. On a humid day, the air-con is certainly welcome too. A slimline timber work desk sits immediately behind the bed, in a location that seems strange at first, but affords a view out to the pool. If you’ve got to work here at least it can be softened with a great view! Wifi is included in the room rate here. Beautiful timber cabinetry provides generous storage space and I always love coat hangers that aren’t connected to the rail. Various other amenities are provided to meet the needs of all guests including digital safe, umbrella, slippers, beach bag, iron and board, bathrobes, torch and for that walk to the beach, flip-flops. A traditional nón lá, the Vietnamese conical hat is also provided to encourage you to get right into the spirit of your stay here. There are various places to sit inside and relax. 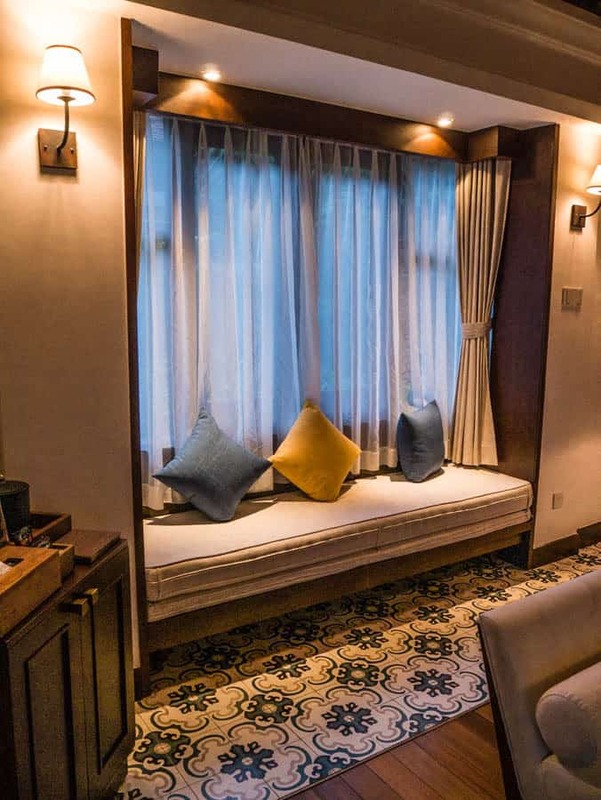 Curl up on the seat inside the window or lounge on the chaise at the base of the bed. Alternatively, head outside for some fresh air. The bathroom area is spacious and beautifully designed, with a separate shower room, complete with an excellent rain shower and if you aren’t careful, scalding hot water. I’m a massive fan of super-hot water, but even I couldn’t stand this heat. The use of glass adds another dimension to the bathroom, providing excellent light, which I love, and the concept of bringing the outside in. Fear not for your privacy, a high wall surrounds the garden outside the bathroom. The dual vanity basins sit in the centre of the bathroom, separating the shower from the toilet. The vanities have a small shelf built underneath, which is just as well, given the huge basin and its non-recessed design means that the majority of the bench is not very usable. A hairdryer is provided although it’s one of those annoying items that many hotels use. It is attached to the wall and you have to hold a button constantly to get it to work. I understand why hotels do this but seriously, if someone decides that they like the hairdryer and want to take it home, then just add the charge to their bill and give me a decent hairdryer. The bathtub sits in front of windows that can be opened making you feel as though you are having a bath in the garden. A full range of toiletries are provided and are routinely replaced, unlike the strategy of many hotels these days, looking for a cost saving, to be stingy on the replacement of such items. A minibar containing basic items is provided along with a good selection of tea and coffee. Worthy of praise is also the amount of complimentary water provided. Four bottles are provided and replaced each day. The provision of water is absolutely necessary in Vietnam, given visitors cannot (or should not) drink the local water. The generosity of six bottles did not go unnoticed and all of it was consumed every day. One point for future consideration, however, will be how The Anam can still offer such a service to their guests without the huge amount of plastic waste they must create here. The pool villas have immediate access to the three-tiered pool outside. Simply put on your swimwear and walk the short distance to the water’s edge, picking up a beach towel on your way. Relax on an outdoor lounge and order a drink or some snacks to have poolside. In the evening, you’ll find the staff have discreetly entered your room to provide a turn-down service, leaving a chocolate on the bedside table to sweeten your night. There is no shortage of dining options here at The Anam, which is also what I would expect. Whilst there are options to travel to nearby Nha Trang every option from fine dining to Vietnamese food and western food is provided here. This is perfect for those who want to enjoy the quiet life here and not worry about where their next meal is coming from. Here’s a rundown of the options, noting that in a future article I will discuss the dining in more detail. Related: Beach holidays in Vietnam and dining at The Anam. The Colonial has a two-fold purpose. By day, it offers breakfast (a small buffet and a la carte), snacks and canapes for VIP guests staying in the suites or high-end villas. In the evening, under the guidance of 28-year-old, up and coming chef, Nguyen Duy Anh, guests can choose from the French-inspired a la carte menu. If you need a change from eating the beautiful Vietnamese food produced at the resort, this fine-dining restaurant has you covered. The Indochine is the hub of The Anam’s daily food rituals. It’s the place to go to for everyday food. Every eating style is catered for. Every dietary requirement is covered. Serving buffet-style meals from breakfast through to dinner, you would be hard placed to not find amazing food to eat. Vietnamese food sits alongside western food, covering the bases for all guests who may not like Vietnamese food as much as I do, or who simply need a break. Breakfast also includes a huge range of bread, pastries, cold meats and cereals. Like most serious hotels and resorts these days, there is also a cooking station, where you can have your daily dose of eggs cooked any way you like. In the evening, the restaurant hosts themed dinners which change on a regular basis. The Indochine is a large restaurant, offering indoor and outdoor seating. With the outdoor seating overlooking one of the three pools located onsite, this is my chosen spot for devouring their tasty food. At night, dine outside under the light of candles and fairy lights for a magical evening. It’s always hard to pick a favourite when the baseline is already exceptional, but if I had to choose, Lang Viet would be it. With a stunning position overlooking the beach and ocean, it’s already ahead of its class. Add to that the delivery of fantastic Vietnamese cuisine and I’m sold. As much as I loved the fine dining experience in The Colonial, when I am in Vietnam, I want to eat Vietnamese food. 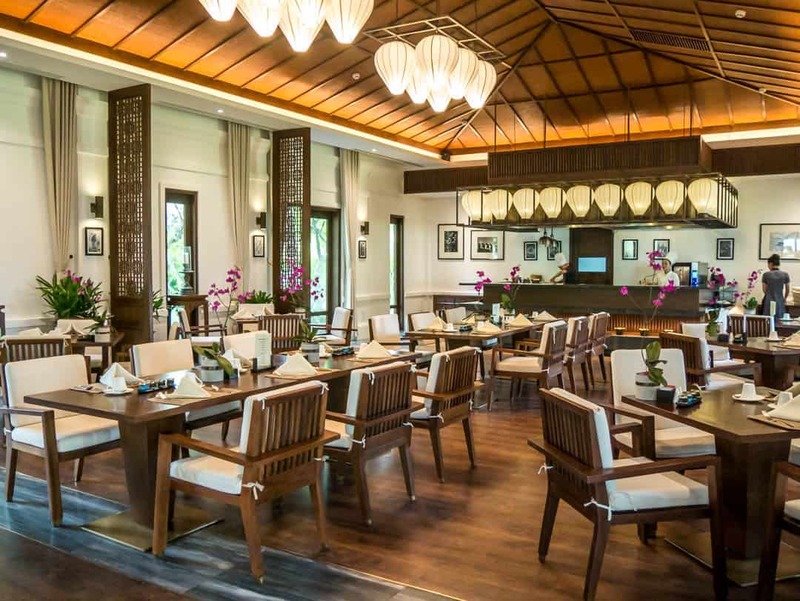 These thoughts are echoed by General Manager of The Anam, Herbert Laubichler-Pichler who noted: “we needed a proper Vietnamese restaurant as guests must have access to Vietnamese food”. This might sound obvious, but I’ve been to many a location where those in charge think it’s more important to serve western food or serve up western beer for example to appease those travellers who like to travel, but like to eat everything they would back home. Even in Kuala Lumpur recently, I had to almost beg to get a local beer, not the mass-produced Heineken that wins an award for global marketing and product saturation but not for taste or local experience. Lang Viet not only provides this authentic experience but twice a week, they bring Mama’s cooking to the restaurant. A strategy initially designed out of a supply v demand issue with chefs and guests, but one which has now become an underpinning part of the restaurant’s modus operandi. More of Mama’s cooking in my upcoming food feature. The Beach Club, located next to Lang Viet and with a view of the ocean has the resort’s adults-only pool. This is the party place, where the General Manager’s love of music is obvious. As the self-proclaimed music man, Mr Laubichler-Pichler is responsible for the selection of music all over the resort. At the Beach Club in the morning, you’re likely to find softer music, designed to make you feel relaxed as you watch the ocean, making you feel as though you could stay and sip wine here all day. By afternoon, the music might start to get a little more upbeat, making way for some funky dance music after 9 pm. The Saigon Bar, located opposite The Indochine and also facing the pool is where it all happens from the early evening onwards. A light afternoon tea leads into happy hour with two-for-one cocktails. Enjoy listening to music and the occasional song by members of staff whilst retelling the tales of your day or simply relaxing. Bar snacks may also be ordered here. Pools are always integral to any great resort. At the Anam, there are three. The lagoon pool in between the pool villas, the main pool in front of The Indochine and Saigon Bar and the pool at the Beach Club. I always relish the thought of heading to a resort spa as it is just one of those luxuries that I never allow time for. It just seems to be an indulgence that I don’t need. Suffice to say that when I finally succumb to the light but strong touch of a massage therapist, I wonder why I don’t allow myself this luxury more often. Trained by the Balinese spa manager, all therapists are carefully recruited and subsequently trained in the traditional Balinese methods. I’ll be honest and say that personally, I would never know the difference of one therapist’s training from the next. All I know is that the knots in my neck seem to fade away and I feel great afterwards. Massages, facials, pedicures and a variety of other treatments are available and bookings are essential. The Anam has access to around 300 metres of pure coastline with white sand stretching as far as you can see. It contributes greatly to the feelings of peace and quiet here. Down at the beach, guests engage in water activities, quietly paddling kayaks on the open water. Others take a dip in the warm waters, a benefit of being in a location that boasts over 300 days of sunshine each year and average temperatures in the high 20s. You can literally swim all year round. Beach umbrellas and chairs are dotted in amongst the palm trees, providing necessary shade from the hot sun and a chance to relax. It’s why it is one of the best beaches in Vietnam. For a moment, I almost thought I was back home in Australia when I saw the familiar colours of yellow and red on the resident lifeguard. It wasn’t totally co-incidental, with their training being conducted by Australian Surf Lifesaving. If swimming, going to the beach or being pampered isn’t enough, there are still so many activities to participate in at The Anam. That’s the great thing about a resort such as this. A veritable wealth of options exist to eat, play and stay or you can just take the easy road, resting up and taking advantage of a slice of tranquillity not normally part of our increasingly busy everyday life. There’s a gym to work off the holiday eating, or if you are able to pull yourself away from your comfortable villa, there’s sunrise yoga on the beach. Volleyball matches are scheduled, or you can play tennis or mini golf. Or, you can watch movies at the on-site cinema. Diving and boating trips can be arranged or if you want to pursue your culinary passions, try a food tour and cooking class in Nha Trang. Despite being bathed in sunshine for most of the year, there is a typhoon season and it can rain outside of this period also. It’s therefore perfect to have indoor options also. 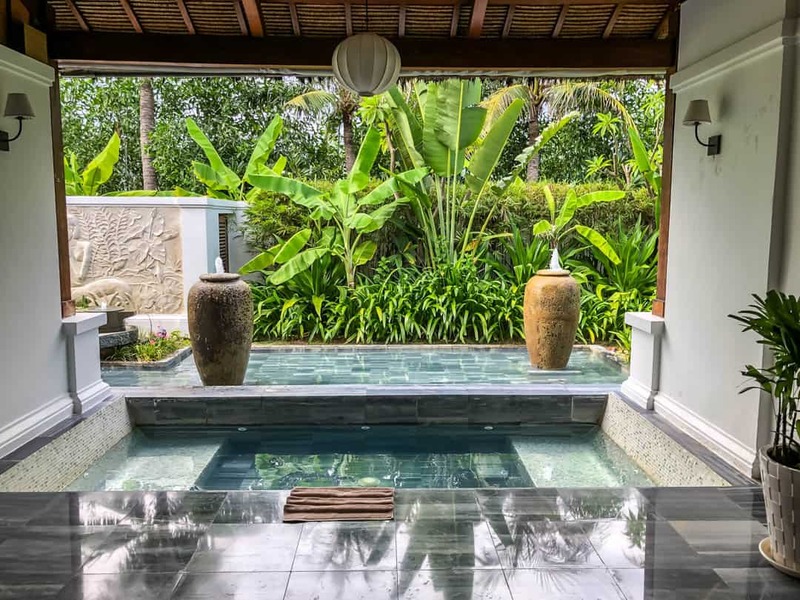 The Anam is located on the Northern end of the Cam Ran Peninsula, approximately 30 minutes drive south of Nha Trang and 20 minutes from the Cam Ranh International Airport. We flew with AirAsia from Kuala Lumpur to Vietnam, landing at Cam Ranh International Airport, a new and modern airport. The flight time was one hour. Flights also arrive from Ho Chi Minh City (one hour) and Hanoi in the north (1.5 hours). Taxis operate from the airport, however, The Anam also operates a shuttle bus that can also be used to go into Nha Trang on a daily basis. The Anam provides the ultimate escape away from everyday life and the noise and fast pace of the big cities. From the resort’s interiors to the external landscape, everything makes sense and exists in harmony together. The staff here are part of the whole experience and should not be underestimated. Their attention to you as a guest is a welcome feature. Guests don’t just pay top dollar for a nice place to stay. They pay for the whole experience and having staff that are at odds with the resort’s philosophy and culture can bring it all crashing down. From a simple hello with the gardener to the staff at breakfast remembering the kind of tea I like, or simply welcoming me when I walked in on them way too early for breakfast, they made my stay a delightful experience. This comes at no surprise considering that the owner favours loyalty and creates an environment where all staff feel part of the team. His company has been in operation for 22 years and many of the original staff remain. It’s likely that in time, you’ll see the same trend here. The average stay for a guest at The Anam is three days, which doesn’t seem nearly long enough. This average is brought down by locals who have discovered our little secret and come for a weekend break. The Australian market is strong, with the average Aussie staying 6-8 days. Now that seems more my style! 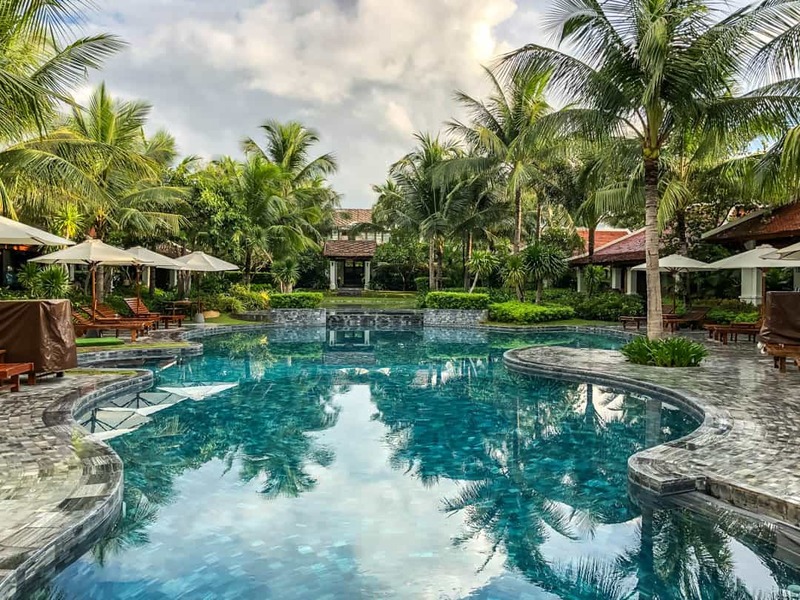 If you are looking for a fun Vietnam beach holiday at one of the best luxury resorts in Vietnam, The Anam must be on your list. For other hotel reviews in Vietnam and Asia, check out our Stay with Me page. The Anam is a part of the WorldHotels Portfolio. We were guests of WorldHotels, however, as always, all editorial content is completely independent and all thoughts, photography and opinions are our own.